It took Indigènes to remind the French that they owed their liberation not only to De Gaulle’s largely white Free French troops but also to 134,000 Algerian soldiers, 73,000 Moroccans, 26,000 Tunisians and 92,000 “others” from Sub-Saharan Africa. Indigènes means “natives” but the English version of the movie was called Days of Glory, which rather took the sting away. Yet the French have still largely ignored their massive empire armies of both world wars. And so have we. Where are the great films, the great novels about the Indians who fought for King and Empire at the Somme, and in North Africa and Italy? Wandering the Great War cemetery at Chemin des Dames – the atrocious 1917 offensive, which won for General Charles Mangin the title “Butcher of the Blacks”, and led to French mutiny – and the British Second World War graves at Sidon in southern Lebanon, I notice how the Muslim dead, mostly Senegalese and Algerians and Tunisians in the first graveyard, Indians in the second, are separated from their non-Muslim comrades-in-death. A few metres of grass keep infidel and believer apart (the definitions are interchangeable, of course) as if sharing the same cemetery is quite enough, without accepting that all were brothers in humanity. It’s the same today. A recent exhibition in Beirut showed archive footage of Australian troops in the 1941 invasion of Lebanon, fighting and dying and laying railroad tracks and manning gun positions on the Beirut Corniche. The Lebanese flocked to see the films, especially Lebanese Armenians who remembered how Australian troops of the Great War gave their food to the dying victims of the Armenian genocide 23 years earlier. But there were no pictures of the Indian soldiers who fought and died in Lebanon. So it’s worth a glance at how “we” Westerners regarded “our” soldiers over the past 100 years. All praise to Le Monde Diplomatique for drawing our attention to a sand dune beside a small forest road not far from the old Courneau camp in the Gironde which is bleakly decorated with two memorials. One shows African faces, sculpted in stone. The other says: “To the greatness of Allah.” Yet in a war that for the first time commemorated the individual names of the fallen, all that is written here is a dedication “to the 940 Senegalese and 12 Russians who died for France 1914-1918”. Anonymity was enough for blacks. The French camp of Courneau was a training ground for newly arrived Senegalese troops en route to the Somme, but it was also a hospital base for the sick and wounded of the Somme and Fort Douaumont at Verdun. And when – after weeks under the snow and the rain of shells – they did not die of their wounds at Courneau, they died of disease. A government health inspector predicted in 1916 that the Senegalese, under the autumn rains and cold, would contract respiratory diseases. In a camp of 20,000 largely black troops, thousands fell ill each week. The first soldier died on 28 April 1916, 13 others in May, including a soldier called Dakpé of the 42nd Battalion, “son of a father and mother whose names are unknown”. In the archives, the soldiers’ names are recorded. Mory Bakilé, born at Lambatura, Moriba Keita from Manikoura. The first black French member of parliament, Blaise Diagne, raised his voice in protest. But the “cemetery of Negroes” continued to be filled with corpses. At least 421 Senegalese riflemen died in 1916, mostly from pneumonia, then 12 Russians – recruited to fight in France by the pre-Bolshevik Tsarist government – and then 88 American soldiers died of the same infections at Courneau after May 1918. Sixty-six of their bodies were later reburied with military honours in the US, the rest transferred to the American military cemetery at Suresnes. Their names are on their gravestones. Not so the Senegalese. A local French architect’s appeal for a memorial with their names was overruled. In nearby Bordeaux, says Mar Fall, a sociologist of Senegalese origin, “they like to avoid topics which are unsettling. If we open the Pandora’s box of First World War African soldiers, or those of the Second World War, we will arrive very quickly at the colonial history of the city.” The city fathers promise a real memorial “after further study”. The dead African soldiers, whose graves are clearly identified in the front-line cemeteries, all joined up on the promise of French citizenship. A further little indignity. Originally, the dead African soldiers did have their names inscribed on a wooden board above their individual graves. Then they were reburied in a mass grave and their names disappeared. But wait. If we are not yet ready to confront the black Africans’ sacrifice for us, do we dare – like the Franco-Ivorian journalist Serge Bilé in his new book Sombres Bourreaux (“Dark Executioners”) – investigate the lives of those black soldiers who chose to fight for Hitler? For yes, incredibly, the Nazis let a few serve in the Légion des Volontaires Français. One was Norbert Désirée, a Guadeloupe docker who wanted to fight Bolshevism in opposition to his communist fellow countrymen who were demanding independence for their island. Then there was Louis-Joachim Eugène, also from Guadeloupe, who found German racism less painful than that of his fellow Frenchmen. And the Cameroonian Werner Egiomue who loved Hitler but whose black skin created a scandal in the German High Command. Ahmed Fall from Senegal was used as a propagandist by the German army. How could these men – old enough to be our grandfathers – have collaborated with Vichy or the Nazis, asks Malika Groga-Bada, a journalist for Jeune Afrique, originally from the Ivory Coast. “Patriotism? A desire to be recognised?” Unforgivable, of course. But history is cruel and there is plenty of rusting barbed wire beneath the snow. Why, I still have copies of Signal, the German propaganda magazine that remained on open sale in Paris until the 1980s, which show German troops throwing raw meat at Algerian prisoners-of-war in 1940, photographs which depict the indigènes as animals fighting for food. 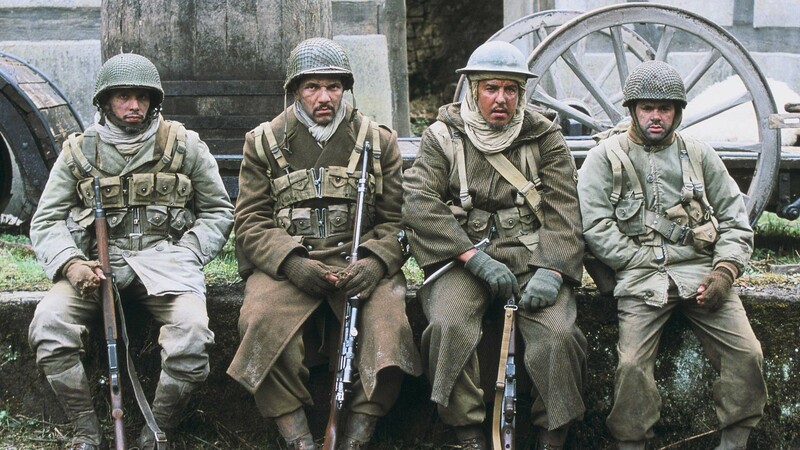 We forget that these poor men were also our Allies.